Hyper Mass from Biotech is a dietary supplement that helps increase body mass and muscle mass in a comprehensive way. Carefully selected composition helps effectively cover additional calories, and supports post-workout regeneration. The product is distinguished by the addition of micronized creatine monohydrate and dietary fibre, which supports our digestive system. It contains as many as three forms of protein: whey protein isolate, whey protein concentrate and calcium caseinate. As an energy source, the preparation provides as many as three types of carbohydrates: maltodextrin inulin and corn starch. Whey protein isolate is characterized by high bioavailability and fast absorption time, thanks to which it finds its use after strength training in order to intensify anabolic processes. Another source of protein is the whey protein concentrate, absorbed a bit slower than the previous one, but still provides good digestibility. Calcium caseinate, like previous sources, is a compound isolated from milk. On the other hand, the time of absorption differs - it’s definitely the longest. Thus, it ensures a constant supply of amino acids (up to four hours after consumption), therefore it’s perfect for longer breaks between meals. TriCarbo Matrix is a combination of three carbohydrate sources with different glycaemic index and absorption time. Maltodextrin, although it’s a complex sugar, provides instant energy. It has a higher glycaemic index than pure sucrose, which is why it’s very common in large quantities in Carbo preparations. Inulin is a natural sugar with a very low glycaemic index (IG14), also classified as soluble fibre. It occurs mainly in vegetables. It’s a natural prebiotic that provides a medium for friendly intestinal bacteria, thanks to which it makes the food better digested, and the nutrients are better used by the body. The last source of carbohydrates is corn starch. Starch is a storage of energy in plants, as well as glycogen for us. Despite the high glycaemic index, it’s digested much slower than other sugars, which is why it provides us with energy gradually. Creatine monohydrate in micronized form - creatine is the most popular supplement used by athletes. In the body, it’s transformed into another compound, phosphocreatine, which rebuilds the reserves of ATP - the basic energy carrier in the human body. Creatine supplementation helps increase strength and muscle mass, reduces fatigue and improves fitness in sport. The process of micronization makes the creatine molecules smaller, and hence - it’s better soluble and assimilable to our body. 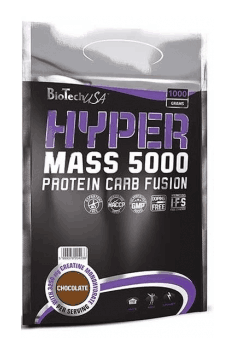 In conclusion, Biotech Hyper Mass is an excellent choice for people who want to increase their muscle mass or do long-lasting workouts and want to cover additional calorie needs. People who choose Hyper Mass will appreciate the addition of highly digestible micronized creatine and dietary fibre, supporting digestive processes. Mix a serving (65 g = 4 heaping tablespoons) product in the shaker with 450 ml water. Take 1 serving in the morning and 1 serving directly after workout. On rest days take one serving in the morning and one serving in the evening. I recommend the product not only to athletes, but also busy people who often do not have time to eat. Delicious flavours and respectively sources of carbohydrates and proteins with different absorption kinetics will provide us with a constant level of energy and building components. Supplement ready to be consumed at any time, just add water. vanilla: TriCarbo Matrix 67% (maltodextrin, inulin, native waxymaize), Protein Blend 23% (whey protein concentrate, calcium caseinate, whey protein isolate), micronized creatine monohydrate, thickener(cellulose gum), flavourings, emulsifier: lecithins (soy), salt, sweetener(sucralose), colour (tartrazine)*. raspberry-yoghurt: TriCarbo Matrix 65% (maltodextrin, inulin, native waxy maize), Protein Blend 23% (whey protein concentrate, calcium caseinate, whey protein isolate), micronized creatine monohydrate, thickener (cellulosegum), flavourings, acid (citric acid), emulsifier: lecithins (soy), salt, sweetener (sucralose), colours (Allura Red AC*, indigotine). caramel-cappuccino: TriCarbo Matrix 64% (maltodextrin, inulin, native waxy maize), Protein Blend 22% (whey protein concentrate, calcium caseinate, whey protein isolate), micronized creatine monohydrate, fat-reduced cocoa powder, thickener (cellulose gum), flavourings, instant coffee (1.2%), emulsifier: lecithins (soy), salt, sweetener (sucralose). *Tartrazine and Allura Red AC: may have an adverse effect on activity and attention in children.